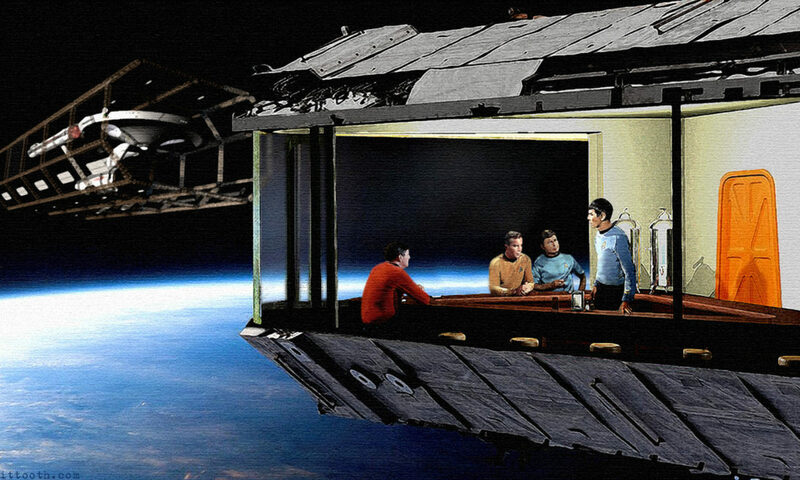 Get Stuck In A Think Tank! Another comic book review?” you may be asking. Yeah well since this is my blog I get to review whatever I have been up too, and lately that has been a lot of comic books! 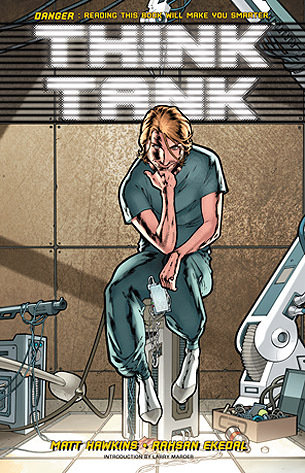 Think Tank is a comic book released by Top Cow Comics (one of the founding members of Image Comics), and it is written Matt Hawkins and illustrated by Rahsan Ekedal. Think Tank is about Dr. David Loren a genius DARPA worker who decides that he doesn’t want to make stuff that kills people anymore, but unfortunately the government will not let him go. He is too smart, and he knows too much, so all that is left is to plot his daring escape. This is a fun book because it is so different. It is about an almost average guy who’s big brain makes him a quasi-superhero due to all the cool stuff he can build, and you feel bad for him once he realizes the damage that his inventions cause. Matt Hawkins must have done is research because the tech that David builds is probably close to becoming real. Plus David is that perfect heroic jerk slacker that is almost impossible not to love. The book is in black and white, but Rahsan Ekedal still does a good job with the artwork. His shading is so good that I swear I can almost see the colors anyway, and the way he conveys action is almost perfect. He really brings this super smart idiot to life. This book is different then the stuff I usually read, and it is nice to see something other then The Darkness, Witchblade, or something else over top 90s edgy come out of Top Cow. If they spent more time making comics like this, they would be one of my favorite comic book companies. 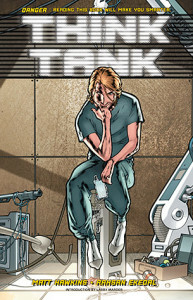 Think Tank is a winner, and I think you should read it! Previous PostPrevious Frozen Blu-Ray Update! Next PostNext My Top 5 Superheroes Without A Movie!